TACTICAL EMERGENCY CASUALTY CARE is a class room, PowerPoint, realistic practical scenario that are PHYSICALLY DEMANDING, instructor-led course from the National Association of Emergency Medical Technicians that teaches EMS practitioners and other prehospital providers how to respond to and care fore patients in a civilian tactical environment. * Evacuation Care (Tactical Evacuation): Treating individuals while they are being evacuated from the incident site. The program also exceeds the 2015 amendments to the California Code of Regulations, Title 22, Division 9, Chapter 1.5, Article 3, §100017(14) and CA H&S §100017(14) (A) for individual first responder training as a State of California Advanced Tactical First Aid Course (Fire/Law/EMS). AUDIENCE: This course is for all levels of practitioners including First Responders, Emergency Medical Responders, Emergency Medical Technicians, Paramedics, Trauma Nurses, Emergency Room Nurses, Nurse Practitioners, Physicians Assistance, and Physicians. This course DOES NOT teach tactical maneuvering or SWAT Tactics but rather tactical application of medical procedures under hostile conditions. PREREQUISITES: This course is PHYSICALLY DEMANDING! Prospective applicants will be expected to lift heavy objects, function in confined spaces, under low visibility, extreme noise, and be required to move and/or communicate under stressful conditions. STUDENT ATTIRE: Attendees are encouraged to wear the clothing that best represents the attire required for their job. For the FIELD TRAINING, attendees SHOULD WEAR clothing to ACTIVELY participate in REAL-WORLD SCENARIOS that WILL get SOILED with DIRT/MUD, ARTIFICIAL BLOOD, and POSSIBLY WET. COURSE FORMAT: This classroom, realistic practical scenario based includes instructors, PowerPoint, Video, Physical and Live tissue skill interactions throughout the course. 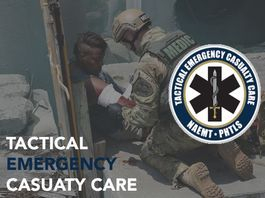 This course is a 16-plus hours course that covers the topics that are orientated to civilian tactical medical providers and is fully compliant with the recommendations of the Hartford Consensus I, II, III and IV, the CoTECC standards and the foundational principles of Tactical Combat Casualty Care. 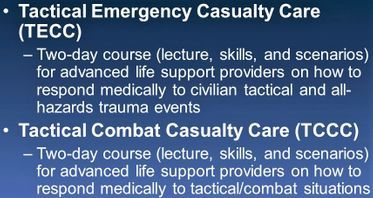 Course is updated with the NEW SCIENCE by the Committee on Tactical Combat Casualty Care (CoTCCC) immediately as NEW TECHNOLOGY is implemented. 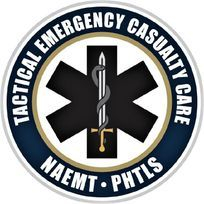 CERTIFICATION: Upon completion of the course, students will receive a NAEMT Tactical Emergency Casualty Care (TECC) certification valid for 4 years and 16 hours of CMEs/CEUs. California Law Enforcement may submit POST-2-213/213A for CPT credit. Texas Law Enforcement Officers who have their commission are eligible for up to 20 hours of TCOLE credit hours.